I'm chugging away her at BFS headquarters getting the next TWO patterns ready for you all. That's right, two. In the mean time, as I crunch numbers, edit, and devise pattern release strategies, I've been thinking about color. In this month's issue of Seamwork (an awesome online sewing magazine from Colette Patterns) there is an article about creating a personal color palette. I've definitely gone through color phases. As a punk sixteener, I was fond of black and every possible combination of neon and animal print. In my late teens and into college, I made a complete 180 and confined myself to earthtones only. I wore quite a bit of brown, along with colors like avocado, moss, and harvest gold (and any other colors usually associated with 1970's home decor palettes). After college I tried to expand my color repertoire and found myself gravitating to blues. Indigo, chambray, lavenders, mauve and other cool tones. Perhaps it was part of a post-college re-invention. Changing your wardrobe and palette is tremendously transformative as part of a life change. Rochelle over at Lucky Lucille wrote recently about being a blue-gravitating gal herself, but discovered that in spite of her attraction to the color, she felt she looked better in warmer tones: Golds, greens, orange, etc. As a fellow pinkish-toned person with dark hair, I was at first defiant. As an anarchist of style rules in most contexts, I felt the need to balk against this concept. Then I bought some warm, olive green french terry. After putting on the top I'd made from it, I noticed my features pop and my overall look and complexion improve to me immensely. It was quite the opposite of what I expected. I also rediscovered a saffron yellow cardigan as the weather warmed up...low and behold, that same effect. Then I looked back at old photos and realized that I was indeed on to something with the earthtones in college. More college earthtone selfies. Here's a clip from a video piece featuring a fantastic orange sweater. I feel like this former pullover (gone now, sadly) is on its own the basis for a color palette. This was a crazy sweater dress, plus copper cateye glasses. I posed with this guy on tour with my old band in PA. I wore the striped tshirt pictured for years until it literally disintegrated. Now, I don't know about you, but I read once that fair skinned folks should stay away from yellow and green, lest it make them appear wan and sickly. Friends, I found this to be quite the opposite. And thus, my spring palette reinvention begins. Out of my strong desire to power sew a whole compatible wardrobe in a flash (ever had that feeling?) I looked in my fabric stash: Navy, indigo, mauve, lavender, pops of red and pink. I'd say nearly 75% of the fabric I have stashed fits that criteria. Mostly cool. In my closet, the same was clear. 1. Take loved garments (good shape, cut, print) that don't flatter and dye them! We have a proliferation of Dockweed and Pokeberry in the garden, and an industrial sized spice container of turmeric and anatto. I think this is the summer I try some natural dyeing. I'm not getting rid of some of my faves, but perhaps they just need some warmth to balance them out. 3. Create a color palette for fabric shopping/project planning. 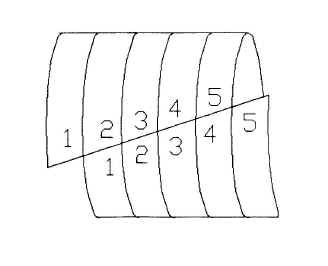 I'll follow the Seamwork instructions and create a swatch booklet. I love this idea. Also plan to give each color appealing food-related name. So far I know I need: Olive, Saffron, Paprika, Pecan, Blood Orange, Cream, Salmon. Are you planning a summer palette? Do you change your colors to be harmonious with your complexion or do you defiantly mix and match? Or do you just wear all black and call it a day? My style is constantly changing. I discover new sides of my aesthetic personality. Though these new feelings tend to take center stage, parts of my short-in-comparison personal history still cling. In my teens, I was very active in the punk scene and was particularly enamored with the diy aesthetic, iconoclast imagery, and performative costuming. The art school punk scene of the early 70's had a spirit of experimentation that to this day is a component of my personal stye. After college I also worked in a Vintage clothing store and amassed an excellent collection of vintage stuff. The craftsmanship of the pieces, as well as their aura of time, drew me to them. Finally, some bits have crystallized - I always maintain a touch of vintage and punk - but others remain fluid. The more I read and research and experience life, the more history I have to draw from. As my life and lifestyle changes, I find new ways to incorporate these old loves into a style that feels right in the present. One thing I've thought a lot about lately is being 'understated'. I've been very visually flamboyant in different times of my life. Nowadays, I'm interested in dressing more 'conventionally' for lack of a better term, but with something strange or special to set it off. I find these nuances more compelling at my age than 'making a statement' like I did when I was younger... though I may be so deep in a weirdo fashion bubble that my dressing 'conventionally' still looks weird to most people. I have been especially curious since moving out of the city. This month I wore some of my Cabin samples around and found them to work well with my new lifestyle. I see myself making a few in different fabrics to update my wardrobe for my 'new life' in the country. I know, the suspense is too much to bear. Hang in there! Cabin comes out in October! How often does your style seem to evolve? Do you have a solid uniform or do you like to mix it up? Do styles of your past still find themselves in your present look? I am constantly editing my closet. A few years ago, I became fed up with the excessive amounts of clothing I accumulated as a thrifter, vintage collector, and fashion appreciator. Not only that, I was a bit of a clutterer in other regards. At some point, I developed a system for editing my life's contents, specifically my clothing. Though my criteria constantly changes, I am always editing. It took a while to get over the pangs of nostalgia. I hung on to sentimental garments that I didn't wear and favorite pieces that didn't suit my style. I would bring home weird thrift store things just because they were weird or seemed to represent what I was trying to convey with my fashion. Sometimes these things stuck...other times, the novelty wore off quickly and I was left with a surplus of clothing. When I first started downsizing it was a bit traumatic. As soon as I developed a rhythm, however, it became easier and easier. Pull in items, wear them and decide what was a staple, what worked, and what I wore, and recycle the others. Sometimes, I gifted things to friends. Good things were sold in the vintage shop I worked at or at other resale places like Buffalo Exchange. Many things simply returned to the thrift store from whence they came. Either way, I figured they had a good life and were ready to continue on their clothing journey. What made it okay for me, was that I was always buying things from small stores or thrift shops and always recycling them...only taking out of rotation those who had been deemed unwearable (though, these usually ended up as craft projects rather than garbage). Though I don't think I will ever thoroughly distill my personal style into a reliable formula, I feel like my ability to capture a fleeting and highly conceptual 'style' from time to time is getting better and easier. It is at the point where I edit my closets every few months, with a big edit occurring every time I switch over my summer/spring and fall/winter wardrobes. What is most interesting is to see the pieces that stand the test of time. This brings me to the core of this blog post. I am developing a 'service' that seeks to help others do the same. My desire to assist others comes out of a desire to help others achieve this level of freedom and confidence about their limited wardrobe while avoiding the trap of conspicuous clothing consumption that we are lead to believe is normal. I probably buy about 4-6 clothing items for myself per year. This is due in part to the fact that I feel satisfied with my clothing and see the uselessness of excessive shopping and clothes hoarding. I am a convert to the limited-wardrobe system. A continuation of our discussion of the 'blue' silk blouse. The pattern that this blouse was adapted from is a Butterick pattern from the 1940's. It seems to be post-WWII. This pattern came from a lot that I purchased by phoning in to a local auction house. It was a very bizarre and heavily mediated experience that somehow seemed more grounded than the process by which one purchases items off of ebay. 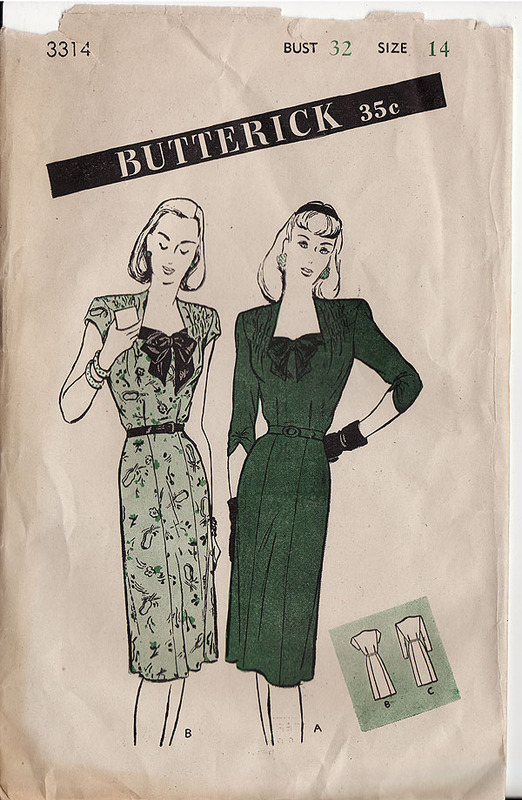 The lot contained approx 28 patterns from the 30's and 40's along with about 6 from the 60s. The majority of the older patterns are in my size range (era specific size 12-14) and in a proportional range I believe to be more suitable to me than newer patterns. The skirt came together with few problems. Since it is adapted from a dress, I sewed a grosgrain ribbon (from the same bag the blouse's ribbon came from) to the seam allowance and folded it over to create the waist. The zipper is gray aluminum 7" ykk I got on clearance (in a pack of 30 different colors) from a cleaners supply website. I thought that I would have to use both <1 yard pieces to make the skirt, but I was able to cut it from one, leaving me with the extra piece for a future coordinated garment. After making the tweed skirt, I thought that I might attempt the blouse portion with the blue silk. It seemed to be a nicely balanced office-oriented sort of look, perfect for subtly dismantling perceptions of female professionals when paired with my activities. More 'film noir' than 'Mad Men'. 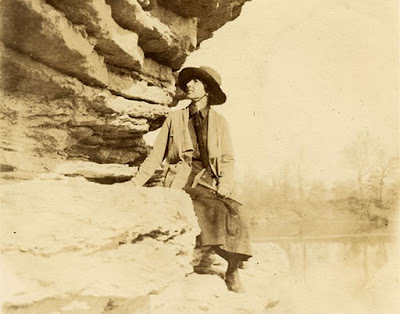 It ended up creating more of a young and elegantly frumpy 1920's naturalist, which I can also get behind. Although very problematic within its own context, I find the different measures of austerity, dressing etiquette and conventions of the early part of the 20th century to be endlessly fascinating. I consider the performance of various identities within a culturally and chronologically 'inappropriate' context to be very exciting, although often subtle and unrecognized unless by blog or social engagements in a realm of fashional importance. There are many who pine nostalgic about the clothing and lifestyle of past eras in a way that I admire but duly makes me cringe when they exist casually (countless statements from vintage lovers along the lines of "I live a retro lifestyle, and love being a homemaker, taking care of my husband, looking beautiful and fulfilling my feminine roles") but I know, in present times, have transformative capacity. Often these processes are enacted by the ones previously mentioned, and despite the complications with feminist discourse, they grapple, albeit clumsily, with manifestations of anti-consumerist sentiments, re-evaluation of the quality and potency of everyday objects, serious considerations of gender roles in a way that feels [to them] an act of agency, not dictated by contemporary social conventions. While I often feel conflicted about these surface level negotiations of notions of change and time, I also admire them. Part of me feels a bit old school and wants to shift the weight of this issue onto the importance of consciousness raising. However, I suppose this drive within me operates in a similarly surface and romantic, only notionally nostalgic, past social systems ie: early feminism. In that sense, the reaction I have to these modes 'unconcious' of historical appropriation are similar to the reactions directed towards second wave feminists. 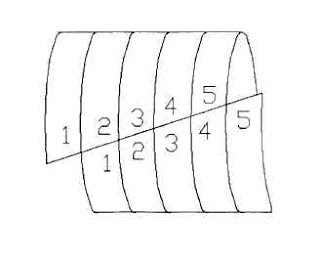 Metaphorically, it feels a bit like the bias-tape designated mobius strip, born of a cyclical nature and ultimately configured to exist in a linear fashion to be applied conventionally. I have had a piece of blue* silk satin in my fabric pile for about two years. It was purchased at a place called the East Bay Depot for Creative Reuse, a source for some other great fabric I picked up on a trip to Oakland, CA to visit friends. It's been historically difficult for me to identify fabric content on the fly (especially blends) though I've developed a bit of a protocol. The idea of a 'burn test' seems impractical to me, especially since I have fire anxiety. I also have a hard time identifying fabric weaves as well, if its categorization falls anywhere beyond plain, twill, satin, jacquard, and any texture vaguely identifiable as 'crepe'. So, as far as I can tell, this blue fabric is made of silk, and of some sort of satin weave. 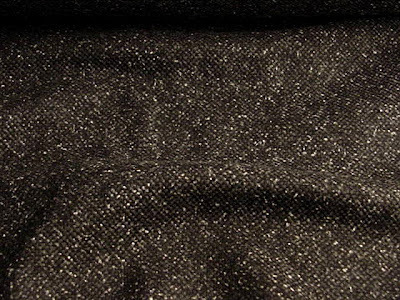 Silk satin is, among contemporary sewing circles, notoriously hard to work with. Stories abound of slippage, pins falling out willy-nilly, over-pressing, spotting, etc. I had an okay time. As far as keeping things positioned and cutting on the grain, I give myself an A-. Practicality aside, silk satin feels simultaneously precious and sturdy, which makes working with it fairly arousing, associations with lingerie aside. It links you to a history of fine garment making, though it also seems oddly utilitarian in its historical duration as a material. A few things that turned out well: Despite a tendency for slippery fabrics to curl and pucker, I was able to press construction into submission with few negative effects. 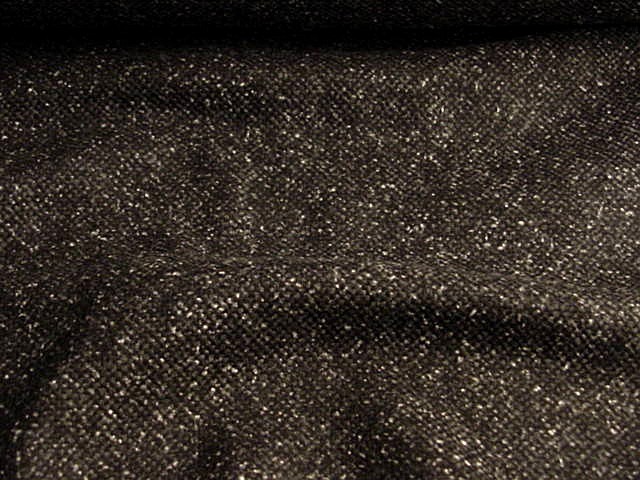 This is the work of a good iron (or, as suggested earlier, a fabric containing hints of cotton and/or rayon). Also (as pictured above) I was able to create some nice smocking, despite the pillowy nature of the fabric. I used one of my new favorite tricks to stay the smocking: Using a piece of the fabric's selvage as a coordinated stay tape. 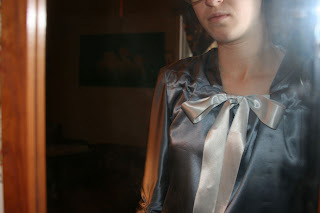 Here is the blouse, semi-finished. The big blue** bow came from a mixed bag of ribbon scraps purchased at the nefarious Sturbridge Antique Textile Fair. The pattern used is the top half of a Butterick dress pattern from the early 1940s. Our next installment will be on the evolution of this particular garment, from idea to object. Future installments may involve discussion of subjects contained herein. If so, this article will link to those articles once created. *blue in this case refers to what is loosely defined by Wikipedia as the following: Air Force, Blue Gray, Cadet, Cornflower, Dark Pastel, Glaucous, Moonstone, Steel, UCLA. This collective color identity best defines the blouse fabric. This reminds me of a project I participated in with artist Benjamin Austin involving conversation conducted to manifest a color sonically and dialogically. I would like to include this work in a future post.